Hello Monday! This Monday, bloggers who budget is back and this time we are styling wedding guest looks at affordable prices! I wore this dress to a bridal shower last weekend, but I can totally see myself wearing this to a wedding! This dress was $40! I love a good find! It is perfect for summer weddings and I just love the color! 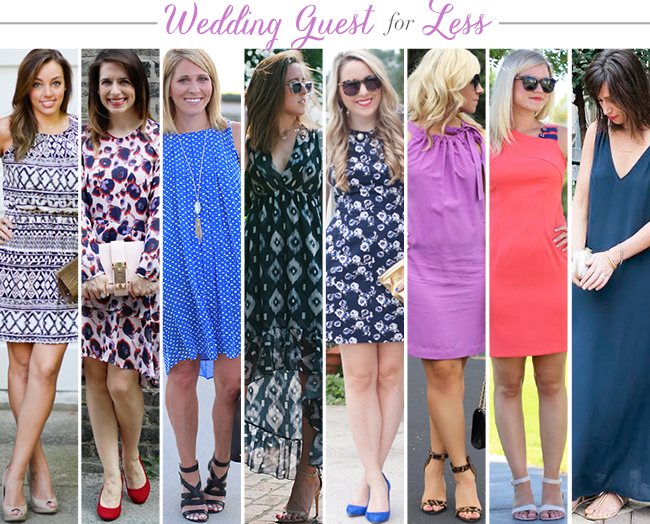 Be sure to check out how these other fabulous bloggers below styled wedding guest looks! You look gorgeous and this is so perfect for a wedding. That is such a lovely shade of lavender and those shoes are killer! Have a great week! This would be perfect for a wedding - I feel like this could be dressed up or down. Happy Monday girl! You got such an amazing deal on that dress! Love that you paired lilac with leopard print heels! Beautiful! This color is amazing on you! And I love your hair--how do you get waves like that?! Thank you! I use a 1 1/4 inch curling iron. I take larger sections of hair so that they are more wave like. That dress is gorgeous on you! I love the color and the bow detail is too cute! This color is beautiful! Too cute! This purple is stunning on you and the studded clutch is the perfect compliment! very nice look! love summer weddings! Such a pretty wedding guest look. Love the color and the hint of leopard in the shoes! Love the color of this dress! It looks so great on you! Ohhhh I am loving those shoes!!! They look so great with that shade of purple! Love a blogger who budgets! I am working on budget of $0 these days so re-working looks from the past is a must! Gorgeous dress! And I love those shoes!! You look fabulous! That is such a pretty color and love the leopard shoes. Perfect for a wedding! Gorgeous dress! Those shoes are so cute! You look gorgeous in lavender, and those leopard heels are stellar! This color is gorgeous on you! Love this.